When businesses grow enough to hire employees, they often do so on a “handshake” type arrangement, without having thought through fully all of the implications of the deal. This person is going to be representing you and your company to your clients, will be on your premises and gain access to all of your knowledge and resources. How can you make sure that what starts out with great promise will continue to grow in a positive way and not shrivel and die? There are lots of strategies to manage your people, and one of the most important is having a clear, shared understanding of the expected and acceptable behaviour while in your workplace. You also need to specify clear boundaries on what is unacceptable behaviour – what lines that if an employee crosses will potentially mean they could lose their job. Unless you have an upfront and frank discussion about your expectations during the first day of employment, you are setting yourself up for more challenge than is necessary. You generally end up having to go back and have the discussion at a later time – usually when your employee has broken one of your unwritten rules and has ticked you off in the process. It also makes it easier for the employee to become productive earlier – they are not having to second guess “how we do things around here”. 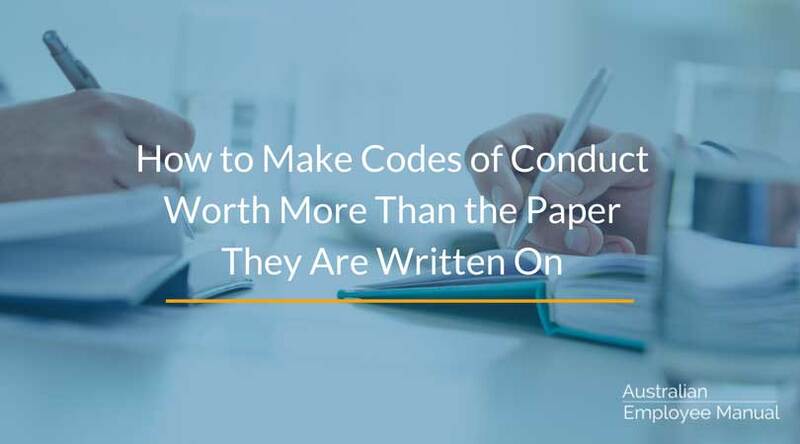 Ideally, your baseline expectations need to be documented in a Code of Conduct which will form part of your HR Policies and Procedures Manual. This will make it very clear to an employee what is expected and the consequences for not meeting these expectations, and makes it easy for the employee and you to refer back to if they stray from the path. It will also assist you if ever you are taken to court in the future for unfair dismissal. What needs to go in your Code of Conduct? Let’s start with the basics – what behaviour do you want to see? Always start with a statement of what behaviour you want to see exhibited by your employees – so they know what to head towards. Remember, what you focus on you receive, so focus on the positive aspects. That said, you also need to set some boundaries and these need to include obeying lawful instructions. This includes things such as complying with professional association rules as well as workplace health & safety. Next, consider aspects of respecting other employees and your clients. This needs to include all aspects ranging from verbal and physical behaviour through to discrimination and harassment. I usually recommend a section on integrity which includes privacy, confidentiality and the need to report conflicts of interest to you. Diligence is one of the most litigated areas so needs careful attention. This is where you specify things such as regular lateness, wasting time, alcohol & drugs and attitude. Many people lose their jobs over lack of diligence, but unless you have clearly spelt out what you expect, you potentially are leaving yourself open for cases before the courts. Finally – consider something on efficiency which includes features such as not stealing or wasting resources or property and taking unexcused absences. 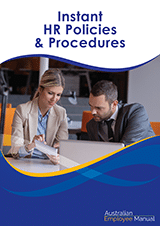 Great – you have your Code of Conduct in your Human Resource Policies and Procedures Manual. Now what? Have you included consequences for breaching your Code? You need to help your employees know what could happen if they break your rules. The consequences need to be directly in relation to the seriousness of the breach. For example – you don’t generally sack someone for being 15minutes late to work. However, if they are regularly late and you have a number of verbal and documented written warning sessions with them then maybe termination for being 15 minutes late is acceptable. Talk it through with your employees. Talk them through as part of their induction process what each point means to you and why it is there. Give them some hypothetical examples so they can make some decisions about whether or not the example is within your Code. Hypotheticals are a great way to explore possibilities and boundaries in a non confrontational manner. Talk about the Code in your team meetings. This doesn’t have to be a “hit them over the head” conversation, but can be a “one company I know had this sort of situation and this is what they did” sort of conversation. Ask your employees if they think a particular piece of behaviour is breaching your Code. The bottom line is you need to let your employees know what is expected of them so they can meet your expectations. Otherwise – they will be just trying to catch shadows.